What are the best batteries for an off-grid energy system? However, installing a renewable energy system, in most cases, requires you to make a considerable initial investment that you won’t get back for several years. 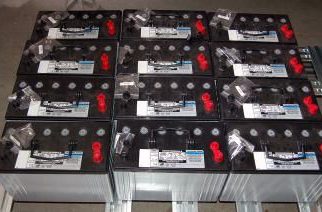 One of the biggest expenses associated with alternative energy systems is the batteries in the battery bank. So choosing the correct batteries for your off-grid system is crucial (and keeping the batteries alive as long as possible is also critically important)! It’s important to first note that you don’t have to buy the 3 batteries we recommend brand new. Doing this will will save you a considerable amount of money when building a battery bank and it helps make alternative energy accessible to those with a tighter budget! In this blog post we’ll try to answer that question in a very simple and straightforward manner. Many of the batteries that are used in renewable energy systems were originally designed for other purposes. The most prominent example of this is the lead acid battery which has dominated the industry for a long time. The fact that they are widely produced also means that they are relatively easy to replace if a battery in your battery bank needs replacing. It should be noted though, that as of late, lithium ion batteries for residential alternative energy systems, like Tesla’s Powerwall, have been gaining ground – but the initial investment into lithium ion batteries is still much more than the initial investment into lead-acid batteries. The Powerwall may eventually change this but at the moment deep cycle lead-acid batteries are the cheapest and most practical solution for a home battery bank. Back when the renewable energy industry was still picking up steam, people that wanted to go completely off the grid would often have to improvise and make do with car batteries. However, car batteries were never built for this purpose and shouldn’t be continuously drained and recharged (which is what they need to do in a solar panel or wind turbine system). Car batteries are supposed to be used only for starting and ignition. If you take a look inside one, you will see that they have a large number of thin plates. These plates have a big total surface area that can facilitate a large number of chemical reactions. When you start your car, these reactions produce the sudden burst of power that is needed for ignition. In essence, car batteries are “shallow cycle” batteries that will quickly burn out when used as storage for renewable power. Before telling you what three batteries are best for alternative energy system’s battery banks, it should be made clear why flooded lead-acid batteries (FLA’s) are better for renewable energy than sealed lead-acid batteries (SLA’s). One of the reasons that some people favour SLA’s is because they require little maintenance. Unlike FLA’s that need to be checked regularly for water level, SLA’s that are used properly can be left alone. 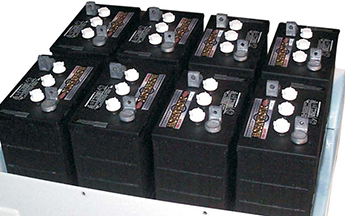 However, sealed lead-acid batteries have two big flaws: they are sensitive and wear out quickly. So if you’re planning on using your solar panel or wind power system every day, this will eventually pose a problem. They also work great in an alternative energy system application. So it’s no surprise that they’re one of the most commonly used batteries in battery banks for renewable energy systems. Even though the five to six year life span of golf cart batteries may seem relatively short, golf cart batteries more than make up for their deficiency in this area by being extremely durable and cheap (you can also use these 7 tips to extend the life of golf cart batteries). In addition, golf cart batteries can also be found almost anywhere, making them a great choice for battery banks. 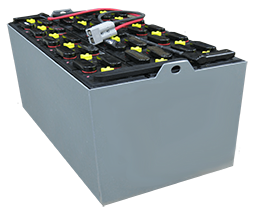 A battery bank that uses one or more industrial batteries follows the opposite philosophy of a golf cart battery bank. Instead of relying on multiple strings of smaller batteries, you use a few or even one battery to store all of your energy. Because these batteries aren’t usually manufactured to standard dimensions, you will have to have one made that is just right for your needs. Or you can try to find an old industrial or forklift battery that’s the correct size for your system and use that. 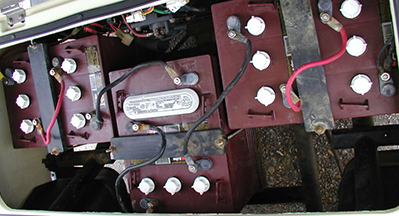 Like golf cart batteries, there are sometimes ways to get free or cheap forklift batteries. 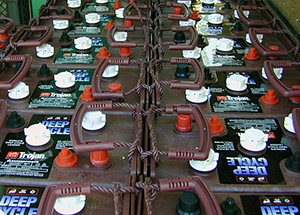 One way is to call up or visit industrial companies and see if they have old or “dead” forklift batteries. Offer to dispose of it for them or pay them a little bit. If they agree, you can then recondition the battery and use it instead buying a new pricey industrial battery. But if you choose to get a new custom made battery instead, you should expect to pay quite a bit. But the good news is these types of batteries are typically built to last 15 to 20 years. But if you don’t mind making a significant investment upfront (anywhere from $2,000 to $10,00) and are alright with spending time keeping your batteries in top condition, then industrial batteries might be right for you. If you want batteries that have a little more capacity than golf cart batteries but don’t want to spend on industrial batteries, L16 batteries are a good middle ground. The good thing with these batteries is that they last a bit longer than golf cart batteries – about six to eight years. However, they are often twice as heavy and the 6-volt models can be twice as expensive.